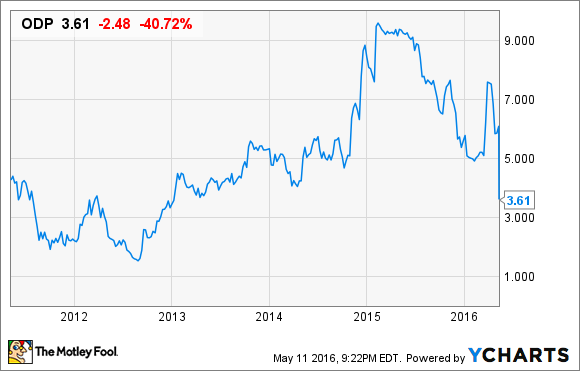 Office Depot Stock Slammed: Value Stock or Value Trap? Office Depot stock has fallen to a multi-year low after its attempt to merge with Staples unraveled. On Tuesday evening, a federal judge issued a preliminary injunction against Staples' (NASDAQ:SPLS) proposed acquisition of smaller rival Office Depot (NASDAQ:ODP) due to antitrust concerns. As expected, the two companies quickly called off their merger plans. Following this news, Office Depot shares plunged 40% on Wednesday, hitting a new multi-year low. Office Depot Stock Performance, data by YCharts. While Office Depot stock is now quite cheap, it clearly has some of the markings of a value trap. Investors should evaluate its long-term prospects very carefully before considering any potential investment in the company. Nevertheless, Office Depot stock may be able to bounce back in the next couple of years. In early 2015, Office Depot was still less than halfway through the integration process following its merger with OfficeMax. While the integration was going fairly smoothly, Office Depot remained marginally profitable and was the clear second fiddle in the office supplies market, behind Staples. Thus, when Office Depot agreed to sell itself to Staples, investors were relieved. Staples offered a combination of cash and stock worth $11/share: about double its value before the merger rumors began, and three times its price today. There was little chance of Office Depot meriting a valuation that high on a stand-alone basis. Based on Office Depot's recent results, the company should be worth even less now than it was then. Revenue declined by 10% in 2015, falling from $16.1 billion to $14.5 billion. Analysts expect Office Depot's revenue to sink to $13.6 billion in 2016. Revenue declines could continue, given that demand for key products like paper, ink, and PCs is likely never coming back. Office Depot's revenue is sinking. Meanwhile, margins have come under pressure. Last quarter, Office Depot's adjusted operating income fell 15% year over year: from $135 million to $115 million. More headwinds are on the way. A little over a year ago, Amazon.com (NASDAQ:AMZN) launched a new specialized marketplace for business customers. Last week, Amazon revealed that it had already reached $1 billion in sales, while averaging a 20% monthly growth rate. Not all of those sales are in categories that Office Depot competes in. Still, given how Amazon.com has decimated a slew of retailers over the past decade, the threat is real. Staples will cut prices to boost sales to smaller businesses. Additionally, Staples plans to become more aggressive now that it has called off the merger. The company is particularly targeting growth among businesses with 10-200 employees, and it plans to cut prices to gain market share. Given all of these issues, it's pretty reasonable for investors to be suspicious of Office Depot stock, even though it now trades for just eight times forward earnings. Notwithstanding all of the pressures it faced, Office Depot performed fairly well during 2015 as it reaped the benefits of its early integration and cost-savings efforts. Adjusted operating income soared to $460 million, up from $289 million in 2014. The gains came from gross margin improvements and lower costs in its North American retail business. However, as the year progressed, Office Depot's performance began to deteriorate. The pending merger with Staples caused "business disruption," particularly affecting Office Depot's sales to businesses. (This also probably gave Amazon more of an opening to gain share.) Office Depot also delayed some merger integration activities as it waited to see whether the sale to Staples would be approved. Now that Office Depot knows it will have to stand alone -- and customers know it's not about to disappear -- it can complete its integration and get back to basics. This could help Office Depot meet its guidance for annual adjusted operating income to rise to $500 million in 2016. Office Depot will also get a $250 million breakup fee from Staples. It could potentially use this to retire its $250 million senior secured notes, which recently became pre-payable (at a small premium). This debt carries a high 9.75% interest rate, so paying it off now would save the company more than $24 million in interest expense annually. Given the tough competition from Staples and Amazon, Office Depot needs to expect pricing pressure for its sales to businesses. Revenue will also remain under pressure in the consumer-oriented retail stores. To keep profit growing in the midst of these headwinds, Office Depot will need to keep reducing its costs over the next few years. That will almost certainly include closing or downsizing a lot more of its stores. Office Depot also needs to swiftly get sales back on track in the business-to-business market, where it has lost ground since the Staples deal was announced. On Monday, Office Depot will hold an investor conference call to discuss some of these issues. While I'm intrigued by the stock right now, I won't be buying unless CEO Roland Smith and his team lay out a bold and compelling strategy for Office Depot to succeed in a tough competitive environment.